Rustler 37 boat test – Just your cup of tea? 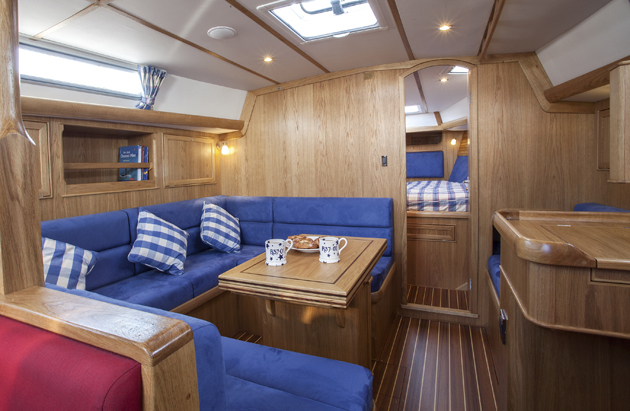 Much as an old-fashioned teapot is said to produce the perfect cuppa, this traditional-looking cruiser is designed to appeal to the discerning cruiser. Can Toby Hodges taste the difference? They say the key to the perfect cup of tea is to use a good old-fashioned teapot. It brews the leaves properly and provides an altogether different tasting cuppa, more flavoursome and refreshing. The extra effort and apparatus involved pays off as a teapot blend is typically enjoyed in company, plus it encourages you to indulge in more than one cup. When was the last time you used a teapot? It seems outdated in today’s era of suave continental coffee machines – a little like the Rustler 37 among today’s spacious, style-conscious European cruisers. The R37 is to a cruising couple what a teapot is to the discerning tea drinker: a timeless design that entirely suits its purpose. And clients of Rustler tend to be discerning types. Rustler’s director Adrian Jones describes owners as typically well-heeled: “Range Rover drivers in their fifties, typically CEOs and fund managers.” As we saw from our August issue, the brand is even the choice of royalty. HRH The Princess Royal recently upgraded to a new Rustler 44 from the Rustler 36 she owned for 20 years. The Cornish company has a loyal client base and an enviable reputation. The obvious question, especially during these times of frugality, is how? In an age when new boats offer increasing volume for the price, where does this appeal for traditional designs come from? This conservative new Rustler 37 is nearly three times the price of similar-sized mass-produced cruisers. Why pay so much for a moderate-sized yacht that looks as if it were designed in the last century? These questions ran through my mind as I headed to Falmouth in August. But, given that the R37 shares a similar hull shape to her larger sisterships, the R42 and R44, I thought I could safely predict the answers – which were confirmed almost immediately when we took this first new 37 to sea in a Force 6. Ask most cruising couples who sail offshore what they want in a boat and a comfortable motion at sea will top their wishlist. The classic West Country conditions we experienced on our test, a gusty south-westerly with a sharp sea outside the harbour, were the type that would expose the failings of a lighter, flatter-shaped boat. There was no slamming aboard the Rustler. She has a deep canoe-shaped hull which, together with her full displacement, helps her part the seas softly. The motion as we went through the waves was so comfortable, in fact, that we could have taken Cornish cream tea in the cockpit . . . from a teapot even. Designer Stephen Jones and Rustler set out to produce a yacht that is perfectly suited to couples. The highly regarded Rustler 36 is 30 years old now and has a long keel, so the new R37 immediately wins on space, speed and agility. In fact, she is comparable to the similar-looking R42, of which 30 have so far been launched. A number of traditional features help promote comfortable cruising, such as a lead-ballasted, fully encapsulated keel, and generous stowage and tankage. A skeg-hung rudder was paramount. Rustler’s stance is that, however solid the stock, if the rudder strikes something hard enough, it can hole the yacht. A compromise between handling and safety was found by using a half skeg. This belt and braces approach is what helped convince Tim and Mary Stevenson to take the plunge with this first 37. “I considered 35-40ft to be ideal and wouldn’t consider mass-produced boats,” said Tim Stevenson during our trial. “I wanted to know that the boat would look after you whatever.” Stevenson is a typical Rustler owner; he predominantly sails with Mary or solo, he plans to compete in the Azores and Back Race next year and hopes to do the ARC one day. Along with its seaworthy build, the custom capability of the Rustler yard remains its chief appeal. Where once dozens of Scandinavian yards offered hand-built glassfibre yachts with classic lines, there are few to pick from today. Rustler puts a bespoke focus on clients’ needs. “People equate us to Morgan cars,” says Jones, referring to Rustler as a ‘quirky small company’. And in common with those classic motors, potential clients favour the ‘country gent’ style of a Rustler. Owners are encouraged to visit during the build. Rustler assigns one team to each boat so the owner gets to know them, making the project more personal. For Tim Stevenson this process was part of the reward of ownership. “I have literally watched it from the mould being made, which has been fascinating,” he says. He is also amazed at the level of custom details – down to taking his inside leg measurement to get the mast step height right. It’s surprisingly rare to be able to test-sail a boat in the conditions for which she has been designed, but as you emerge from Rustler’s Penryn yard, where the yachts are built, you can be in the deep green water in half an hour. In the relative confines of the Carrick Roads it was perhaps understandable that the R37 felt a little twitchy as we tried to find the correct sailplan to suit the conditions. We set full sail, predicting a Force 5, but with gusts over 25 knots barrelling down off the town, prudence demanded less canvas. Even with a few turns in the genoa she was pressed, encouraging a reef in her main. Once out in the clean air and consistent breeze, however, the R37 was in her element. This is not to say she is ungainly in flat water conditions – indeed she was obedient enough to tack through the trots to the maritime museum so we could sail past the moored tall ships – but she seems to relax into a more assured stride when at sea. We decided to swap the genoa for a yankee, which further improved the balance. It made me question why a genoa is the standard offering, as the optional cutter rig suits the purpose and design of the boat more fittingly. The deep cockpit remained bone dry despite having the sprayhood down. She never broached or overloaded on the wheel even with 30 knots over the deck. 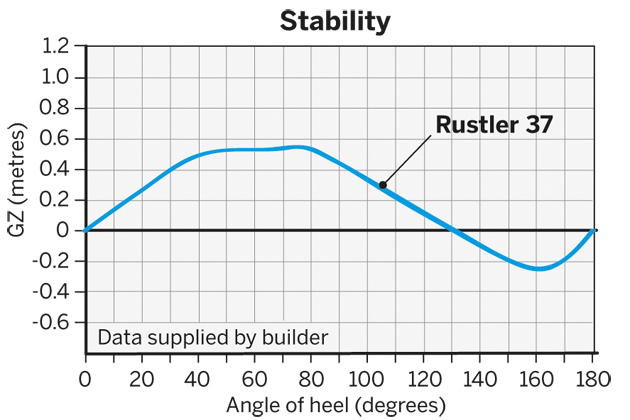 Her very high displacement:LWL ratio (330) and ballast ratio (35.9) offers comfort in stability. Her design promises to be kindly in a blow and stand up to her canvas. Once heeled onto her overhangs, this disp:LWL ratio diminishes and she slips to weather with surprising pace. The conditions afforded a pleasurable few hours reaching in and out of Falmouth entrance past St Anthony Head. 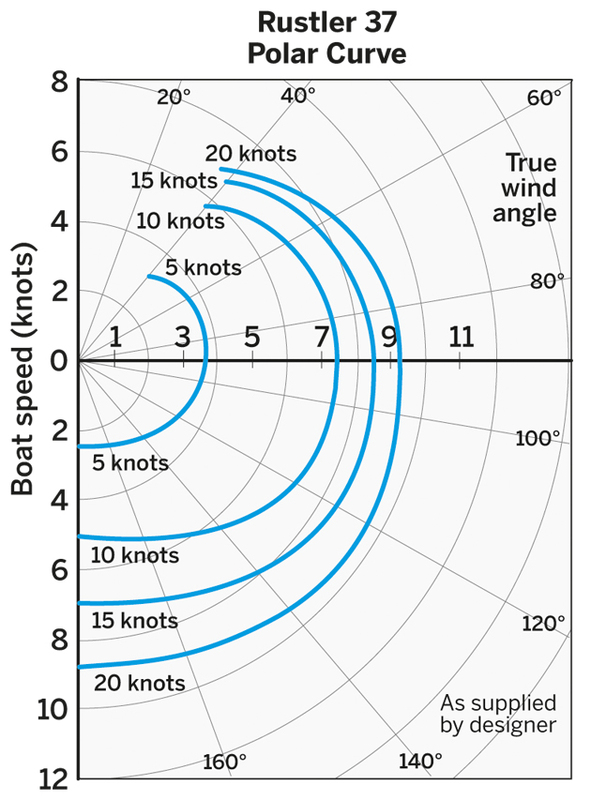 Speeds were steady, close-reaching at 7 knots, broad reaching at mid 8 knots, occasionally topping 9. But what shone out for me was her consistency. We maintained a steady 6.8 to 7 knots for over ten minutes in flat water upwind, despite 8-knot variance in wind. Her long fin keel provides good directional stability. 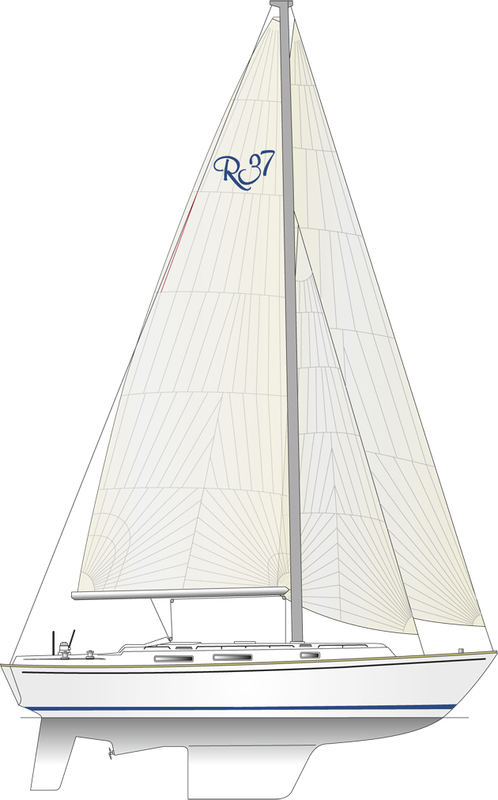 The R37 pointed relatively high and felt light on the helm. Even with the leeward deck awash, she didn’t feel overpowered and provided plenty of grip to feather off the gusts. From the comfort of the cockpit quarter I felt reassured, with coamings at near chest level. I favoured the leeward helming position snuggled against the coaming, with good sightlines below the foot of the yankee. Perched to windward it is a bit of a stretch to the smallish wheel – but then I’m sure Rustler owners don’t ‘perch’ very often. Rustler owners tend to be couples who sail together and occasionally invite friends aboard in port. 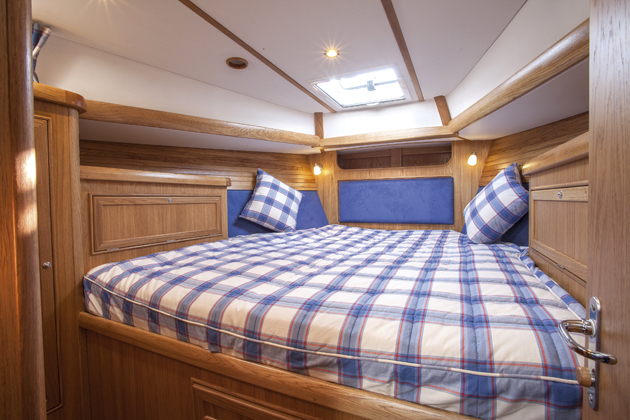 The R37 is therefore perfectly proportioned for a couple below decks, with everything to hand. Modern beamy designs will obviously feel more voluminous, especially aft, where they may even be able to offer a third cabin. But there are no big open spaces aboard the R37, and stowage is abundant throughout. Fiddles and grabrails are used intelligently and bracing is well-considered. Seaworthy design elements abound. The engine is mounted centrally over the keel. There are access covers for maintenance and the whole box can be removed for full service. The calorifier is mounted on an A-frame to one side, making its plumbing accessible. The engine housing also includes an aft-facing seat so crew can remove foulweather clothing at the base of the companionway. And there is a dedicated wet hanging locker beside the steps. Craftsmanship and attention to detail stand out. A small forest of solid oak has been used to create the interior (European oak is standard), fitted and finished by skilled cabinet-makers. Brass washers behind every screw prevent damage to the fine-finished timber, and bronze skin-fittings are employed throughout. The R37 also feels reassuringly rigid. Bulkheads, sub-bulkheads and furniture are bonded to the hull and/or deck. A benefit of an encapsulated keel is that large tanks are incorporated in the bilge. 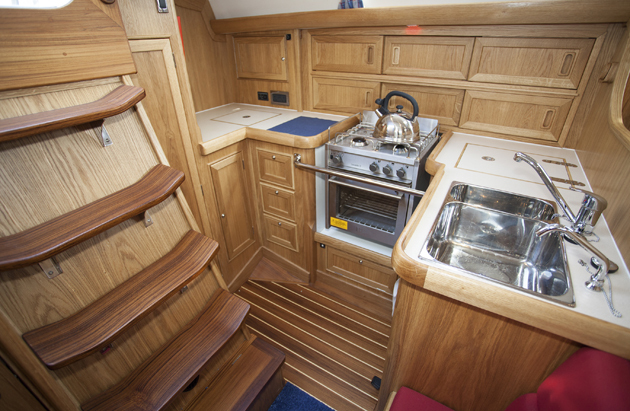 The more time you take to explore the Rustler 37, the more the words ‘brick’ and ‘outhouse’ spring to mind. I remember discussing the pre-launch renderings of the Rustler 37 with some fellow journalists who write for other European yachting titles. ‘It’s a bit old fashioned’ was their dismissive view. This is perhaps understandable coming from my cappuccino-drinking counterparts – to them the R37 is as trendy as corduroy trousers. The interior is more library than club lounge and she might seem to have a slightly self-satisfied air of old money about her. But despite today’s focus on innovation, old-fashioned can still be a good thing when you’re expecting kindly behaviour at sea. Although the first of a brand new range, the R37 immediately inspired confidence in her handling and instilled the comfort and security to make me want to head offshore. 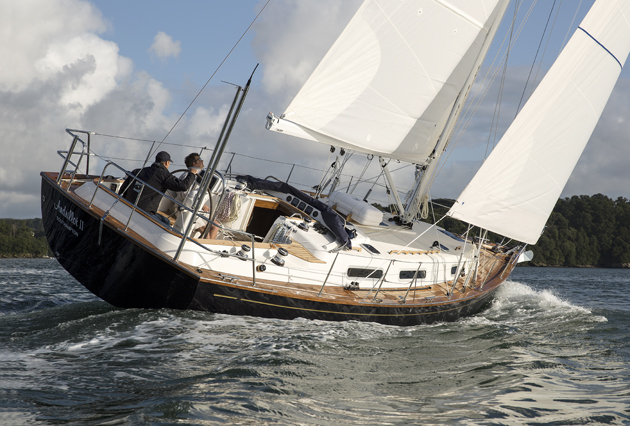 She rewards rather than exhilarates – a pedigree yacht with manners to match. If you want a spacious yacht for sailing with friends, complete with an array of modern gizmos, don’t choose this boat. But if you seek a tried and tested design to look after you and your partner, then the Rustler might be just your cup of tea.